Vadim Zakharov was born in Dushanbe in 1959. He was graduated from the Moscow State Teachers Training Institute. 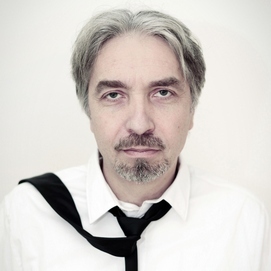 He is an artist, archivist of Moscow Conceptual art scene, collector. Since 1978 he has been participating in exhibitions of unofficial art and worked in collaboration with Igor Luts, Victor Skersis (SZ group), Sergey Anufriev and others. In 1982–1983 he was a participant of the AptArt Gallery. Since 1992 he has been the publisher of the Pastor magazine and founder of Pastor Zond Edition. Vadim Zakharov has participated in the 49th Venice Biennale, 1st Thessaloniki Biennale of Contemporary Art, numerous exhibitions in Russian and abroad. In 2013 he presented Danaë installation – Russian pavilion at the 55th Venice Biennale. He lives and works in Berlin and Moscow.